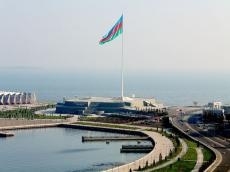 Foreign ministers of Azerbaijan, Russia and Iran will meet in Baku on April 7, said Mariya Zakharova, spokeswoman for Russia’s Foreign Ministry, Trend’s correspondent reported March 31. She said that during the meeting the Azerbaijani, Russian and Iranian FMs – Elmar Mammadyarov, Sergei Lavrov and Mohammad Javad Zarif are to exchange views on regional cooperation issues of mutual interest. “The parties are expected to discuss the promising transportation projects and multilateral cooperation on the Caspian Sea,” added Zakharova. Earlier, Azerbaijani Foreign Ministry’s spokesman Hikmet Hajiyev told Trend that the three countries’ foreign ministers will discuss the implementation of bilateral and trilateral projects, including the North-South transportation corridor project and other issues of mutual interest.